For years Jenny has avoided the woods that swallowed her brother whole, but now that it is time for her to move on to university, she returns one last time to say goodbye. She should have stayed away for nothing could have prepared her for the danger she would find as she is sucked into a magical world full of beauty, but all the more terrible for it. There are strange and terrible creatures that seek her harm and yet whisper of a deeper purpose for her arrival in Faerie. 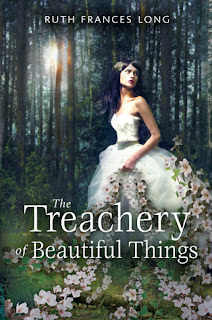 But destiny means nothing to her in her determination to save her brother and escape the terrible beauty of it all. But in Faerie, nothing comes without a price and the sacrifice she is forced to pay may just be more than she can bear. The Treachery of Beautiful Things was written in an almost magical, lyrical prose which was rather beautiful at times, but didn't really serve the story well. I just felt a rather strong disconnect from the series as if I was being narrated to rather than immersed in the story as the events unfurled. In fact the whole story felt like one rather long monologue, keeping me a silent witness without emotion rather than the full attachment I would have preferred. To make matters worse there pacing issues as things felt very weighed down as they were drug out for far longer than necessary. For a story to be really enjoyable, I have to be able to connect to the characters early on in the story, otherwise it is very hard to care about their plight. In this book, there is a major disconnect between the reader and the characters, almost as if a glass partition has been placed between them. This is probably due to the fact that nothing was shown, but told. Even the romance felt stilted and forced, and even though it was there, I just couldn't connect to it, only further disconnecting me from the characters and the book as a whole. The mythology behind The Treachery of Beautiful things combined faerie lore of old with Norse and other areas. The blend was so interesting and compelling that it almost made up for the character disconnect and the stilted pacing, but unfortunately the intrigue of it couldn't carry me for long. Looking over other early reviews, I realize the vast majority seem to love The Treachery of Beautiful Things. I haven't read any other fairy tales of this nature, modern or old prior to this book, so it is quite possible this type of story just isn't for me. So if you enjoy the lyrical nature of fairy tales, then you will probably love The Treachery of Beautiful Things, but for me it's a pass.